Wall decoration showing one wall with the central panel depicting Venus and Adonis, each seated on a chair and holding a long staff, with cupid standing between them, in a landscape; in a panel above a coastal scene with galleys close to shore and small figures around a column to which an over life-size figure is perhaps bound; plate 6 of the series, dated 1781. Soane displayed a complete series of these plates in the Breakfast Room, all with the printed inscriptions trimmed off prior to framing. 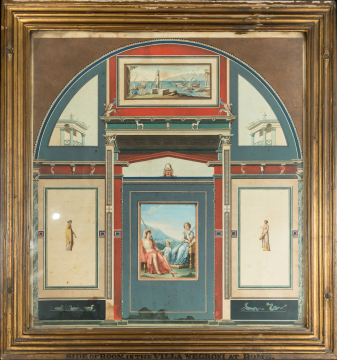 The series consists of eight plates, each showing a different wall of the so-called Villa Negroni, which was excavated in Rome near the Baths of Diocletian in July 1777. The series was engraved by Angelo Campanella after drawings by Anton Raphael Mengs and Anton von Maron. The excavation was in progress when Soane was in Rome between 1778 and 1780. A view of the work in progress drawn by Thomas Jones (1742-1803) is in the Tate collection (TO3544). Jones visited the excavations in July 1777, a month after they began and described the frescoes being revealed in this ancient domestic dwelling as 'painted Ornaments much in the Chinese taste'. He visited with his friend Henry Tresham, who subsequently purchased the frescoes for the Earl of Bristol, Frederick Hervey, Soane's own early patron in Rome. 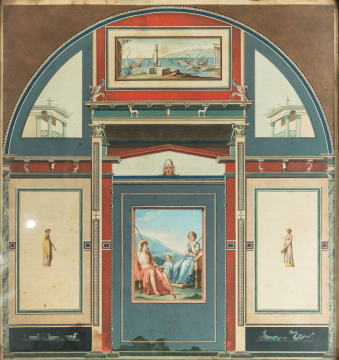 For more detailed information on the frescos, see: Hetty Joyce, 'The Ancient Frescoes from the Villa Negroni and their Influence in the Eighteenth and Nineteenth Centuries', The Art Bulletin (1983): LXV,3, pp.423-440; for more information on this project, see: Steffi Roettgen (ed): 'Anton Raphael Mengs and his British Patrons', Exhibition catalogue, Kenwood House, 1993, pp.144-7. Soane owned a second impression of the series which is in Drawer 84. Set 1.